Successfully realizing the enormous opportunities of these automotive innovations has the potential to not only change driving but also to transform society. From car to cloud―and the connectivity in between―there is a need for automated driving solutions that include high-performance platforms, software development tools, and robust technologies for the data center. With Intel GO automotive driving solutions, Intel brings its deep expertise in computing, connectivity, and the cloud to the automotive industry. Autonomous driving on a global scale takes more than high-performance sensing and computing in the vehicle. It requires an extensive infrastructure of data services and connectivity. This data will be shared with all autonomous vehicles to continuously improve their ability to accurately sense and safely respond to surroundings. To communicate with the data center, infrastructure on the road, and other cars, autonomous vehicles will need high-bandwidth, reliable two-way communication along with extensive data center services to receive, label, process, store, and transmit huge quantities of data every second. The software stack within autonomous driving systems must be able to efficiently handle demanding real-time processing requirements while minimizing power consumption. Intel® C++ Compiler: A high-performance, optimized C and C++ cross-compiler that can offload compute-intensive code to Intel® HD Graphics. Intel® Math Kernel Library (Intel® MKL): A set of highly optimized linear algebra, fast Fourier transform (FFT), vector math, and statistics functions. Intel® Threading Building Blocks (Intel® TBB): C++ parallel computing templates to boost embedded system performance. Intel® Integrated Performance Primitives (Intel® IPP): A software library that provides a broad range of highly optimized functionality including general signal and image processing, computer vision, data compression, cryptography, and string manipulation. Intel® System Debugger: Includes a System Debug feature that provides source-level debugging of OS kernel software, drivers, and firmware plus a System Trace feature that provides an Eclipse* plug-in, which adds the capability to access the Intel® Trace Hub providing advanced SoC-wide instruction and data events tracing through its trace viewer. GNU* Project Debugger: This Intel-enhanced GDB is for debugging applications natively and remotely on Intel® architecture-based systems. Intel® VTune™ Amplifier: This software performance analysis tool is for users developing serial and multithreaded applications. Intel® Energy Profiler: A platform-wide energy consumption analyzer of power-related data collected on a target platform using the SoC Watch tool. 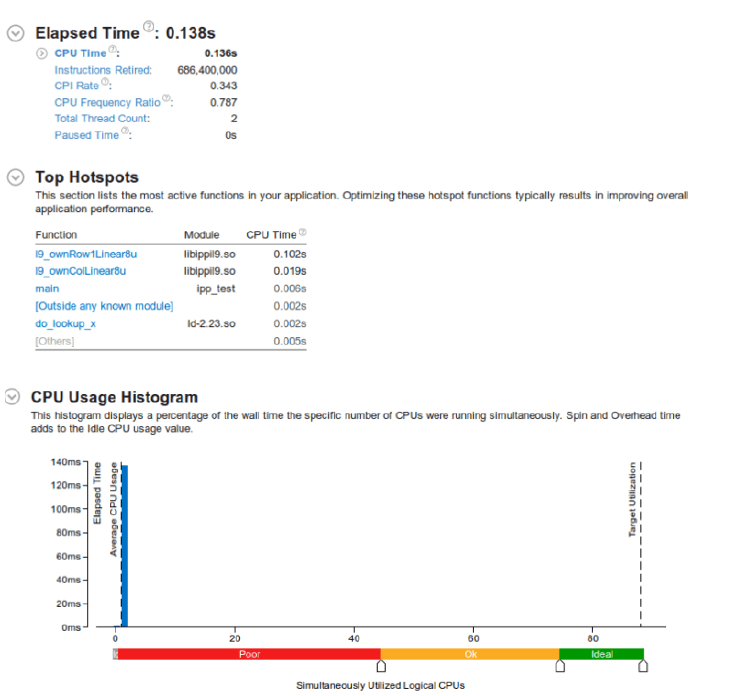 Intel® Performance Snapshot: Provides a quick, simple view into performance optimization opportunities. Intel® Inspector: A dynamic memory and threading error-checking tool for users developing serial and multithreaded applications on embedded platforms. Intel® Graphics Performance Analyzers: Real-time, system-level performance analyzers to optimize CPU/GPU workloads. Advanced hotspot analysis is a fast and easy way to identify performance-critical code sections (hotspots). The periodic instruction pointer sampling performed by Intel VTune Amplifier identifies code locations where an application spends more time. A function may consume much time either because its code is slow or because the function is frequently called. But any improvements in the speed of such functions should have a big impact on overall application performance. Running an advanced hotspot analysis on the previous matrix multiplication code using Intel VTune Amplifier shows a total elapsed time of 22.9 seconds (Figure 1). Of that time, the CPU was actively executing for 22.6 seconds. The CPI rate (i.e., cycles per instruction) of 1.142 is flagged as a problem. Modern superscalar processors can issue four instructions per cycle, suggesting an ideal CPI of 0.25, but various effects in the pipeline―like long latency memory instructions, branch mispredictions, or instruction starvation in the front end―tend to increase the observed CPI. A CPI of one or less is considered good but different application domains will have different expected values. In our case, we can further analyze the application to see if the CPI can be lowered. Intel VTune Amplifier’s advanced hotspot analysis also indicates the top five hotspot functions to consider for optimization. As shown in Figure 2, analysis of the original code indicates that only one of the 88 logical CPUs is being used. This means there is significant room for performance improvement if we can parallelize this sample code. Parallelizing the sample code as shown below gives an immediate 12x speedup (Figure 3). Also, the CPI has gone below 1, which is also a significant improvement. Figure 4 shows the results of running a general exploration analysis on the parallelized example code using Intel VTune Amplifier. 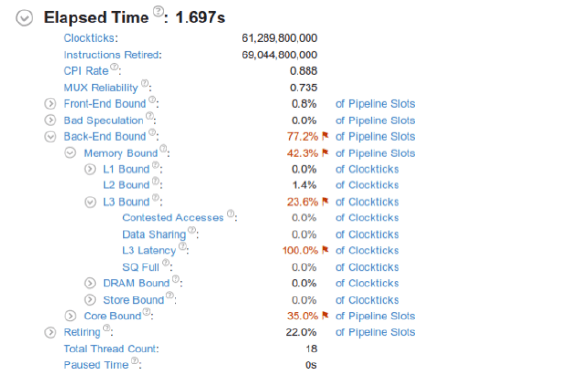 Notice that 77.2 percent of pipeline slots are blocked by back-end issues. Drilling down into the source code shows where these backend issues occur (Figure 5, 49.4 + 27.8 = 77.2 percent back-end bound). Memory issues and L3 latency are very high. 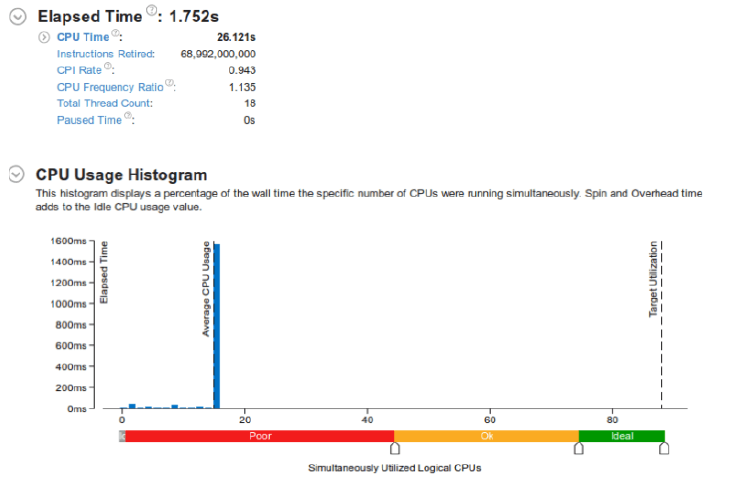 The memory bound metric shows how memory subsystem issues affect performance. 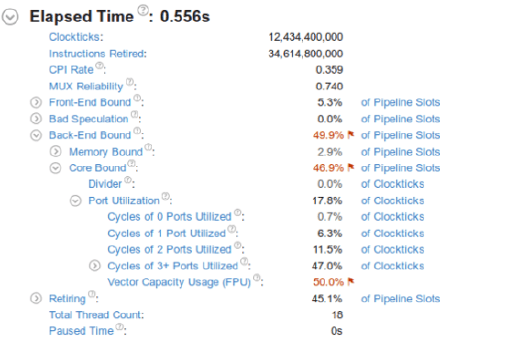 The L3 bound metric shows how often the CPU stalled on the L3 cache. Avoiding cache misses (L2 misses/L3 hits) improves latency and increases performance. The Intel VTune Amplifier’s Memory Access analysis identifies memory-related issues, like NUMA (non-uniform memory access) problems and bandwidth-limited accesses, and attributes performance events to memory objects (data structures). This information is provided from instrumentation of memory allocations/deallocations and getting static/global variables from symbol information. By selecting the grouping option of the Function/Memory Object/Allocation stack (Figure 6), you can identify the memory objects that are affecting performance. Out of the three objects listed in the multiply1 function, one has a very high latency of 82 cycles. Double-clicking on this object takes you to the source code, which indicates that array “b” has the highest latency. This is because array “b” is using a column-major order. Interchanging the nested loops changes the access to row-major order and reduces the latency, resulting in better performance (Figure 7). We can see that although the sample is still back-end-bound, it is no longer memory-bound. It is only core-bound. A shortage in hardware compute resources, or dependencies on the software’s instructions, both fall under core-bound. Hence, we can tell that the machine may have run out of out-of-order resources. Certain execution units are overloaded, or there may be dependencies in the program’s data or instruction flow that are limiting performance. In this case, vector capacity usage is low, which indicates floating-point scalar or vector instructions are using only partial vector capacity. This can be solved by vectorizing the code. Image resizing is commonly used in operation in the autonomous driving space. For example, we ran Intel VTune Amplifier’s advanced hotspots analysis on an open-source OpenCV* version of image resize (Figure 8). 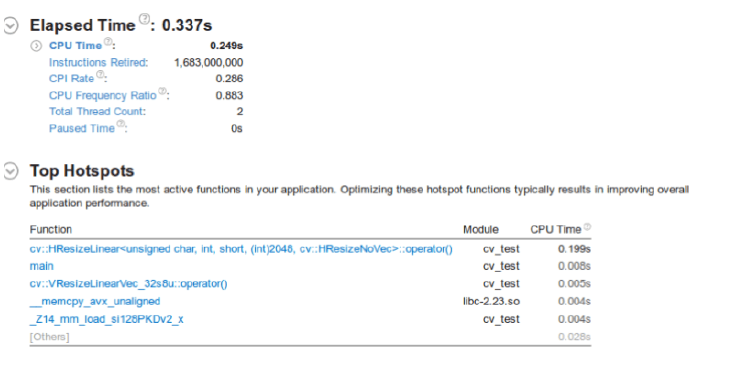 We can see that the elapsed time is 0.33 seconds and the top hotspot is the cv:HResizeLinear function, which consumes 0.19 seconds of the total CPU time. Intel IPP offers developers highly optimized, production-ready building blocks for image processing, signal processing, and data processing (data compression/decompression and cryptography) applications. These building blocks are optimized using the Intel® Streaming SIMD Extensions (Intel® SSE) and Intel® Advanced Vector Extensions (Intel® AVX, Intel® AVX2) instruction sets. Figure 9 shows the analysis results for the image resize that takes advantage of the Intel IPP. We can see that the elapsed time has gone down by a factor of two, and since currently only one core is used, there is an opportunity for further performance improvement using parallelism via the Intel Threading Building Blocks. This is all provided in one easy-to-use software package.